I have to admit. For awhile now, I secretly thought that Twitter was just a tool for a lot of self-indulgent people. I’m not the type to follow Ashton Kutcher’s daily rants. I wouldn’t even follow my BFF’s twitters for that matter. It seems as if we spend every second of our day pushing buttons on devices and adding to the noise of virtual reality rather than living in the physical here-and-now. To what extent do we build and use technology for technology sake rather than enhance the quality of our lives? Technology that actually gets people to go outside and interact with one another rather than hide behind their online personas? Who would’ve thunk? What I remembered most from the movie, “Minority Report” was not Tom Cruise but the touch screen interface. The movie was made in 2002 and I remembered thinking, we were probably 8 – 10 years away from achieving that. Only a few years later, I saw touch screen interface being demo’d online via a video from a university think-tank and now in Microsoft Surface, and I thought, wow the future is here. Last night, as I watched election coverage on CNN, I was amazed when Jessica Yellin, a CNN correspondent, “beamed in” to speak to Wolf Blitzer. At first, I thought the halo around Ms. Yellin was some technical glitch; perhaps there was something wrong with the broadcast. But, no, she was a real hologram. It was just like princess Lea saying, “Help me, Obi-Wan Kenobi.” Star Wars technology is here. I was also impressed with what CNN called, “The Why Wall,” where the pundits analyzed the demographics of each state wide result. Having just completed a grueling week of user testing, I fully appreciated the visual breakdown. Obviously, when I think back on this election, it will not be just CNN’s special effects wizardry that I remember, but that’s a topic for another blog. Now if only I can have a C3PO to around the house to take out the garbage for me. Most clients think they know their business and when they approach User Experience professionals, they’re anxious to get wireframes cranked out. How do we get clients to take a step back and engage in strategic type activites to optimize their technology solutions? For me, this didn’t happen overnight. I stopped obssessing about whiz-bang interfaces and took an active interest in helping clients think about design in terms of return on investment. Because I always spoke my mind and articulate ideas in terms of how they drive the bottom line, clients began to include me in strategic meetings. Below are some of ways I incorporate strategy focused activities into my process. When I first consult with new clients about a project, I let them know that analysis and research are an integral part of my process. It allows me, the UX designer/Business Analyst/IA Minion to understand their business from the inside out. I explain that analysis, interpreting metrics, product roadmapping, etc. can optimize return on investment. By interpreting indicators on usage patterns, we can pinpoint what’s not working and leverage winning features. The result is a cohesive product vision that differentiate the client from their competitors. Articulating your design in business terms is a great marketing strategy. Before my first formal meeting with the client, sometimes even before the contract is signed, I always conduct a quick site audit. This gives me a fresh perspective before I know anything about the project and clients love a fresh perspective. I record my impression on branding, business objectives, and how well the design and implementation drive the business objectives. I always think in terms of return on investment. This gives me fodder to speak about the project in business terms as opposed to design terms. Incidentally, if I get the contract, I bid the hours I spent back into the job. If I don’t get the contract, then it’s good PR. Request for reports at the first meeting. Be prepared to explain what trends and patterns you hope to discover or why you want look at data for specific feature sets. If you don’t yet have an idea which reports you need, tell the client that you will email a list of reports that you want pulled. This lets the client know that research is an integral part of your process. It the project is a start-up, conduct topic and keyword research to define search volume. For qualitative analysis, inquire to see whether any surveys or focus group testing have been conducted and what the findings were. Finally, ask the client how or if the business has responded to the results from analytics and surveys. Don’t be a gatherer of requirements. Be an expert. When conducting interviews with stakeholders, don’t just gather requirements. Work with clients to prioritize requirements and use cases based on business objectives and the research that you’ve conducted. You may propose new requirements to refine and simplify workflows. Always couch your input based on business objectives and the bottom line. I always preface wireframes with business objectives and usability goals. Clients gets sick of this after subsequent meetings, but they learn quickly to evaluate wireframes based on the real business goals. This is also helpful when your wireframes are circulated to other team members, because the business objectives and usability goals is a reminder of the foundations of the project. It started last year when I began getting interested in analytics, but it’s really transforming. now. I’m not a web analyst, nowhere near. But more and more clients are hiring me to help with product roadmapping. More and more, I’m looking at product design and marketing strategy from a chicken and the egg perspective. Recently, for several projects, I’ve started with the analytics, the traffic, the market research, search volume, then work backwards to define the solution, the return on investment. So I have the egg, I have to figure what kind of chicken lays that egg. Usually, clients will build a solution, then develop campaigns to drive traffic to it, but lately, I’ve been getting projects that are reverse. It’s not, “If you build it, they will come.” It’s more like, “They’re here. Now build something that they need.” I’m not just designing some test feature. I’m designing actual new sites with little more than a domain name as a requirement. After this excersise, my goal is to have a mission for the user experience, because a deep user experience will brand the solution. At heart, I’m still an interactive designer. It’s what I love to do. But building a sound business foundation for your design is critical to its success. If you don’t do this, then if you build it, they will not come. I love books. I have a ton of them. OK, maybe not a ton, but I estimate I must have about 600 books or more. In my days as a graphic artist, I’ve designed two book covers, so I have an affinity for the art of cover design and the construction of books. I read everything from technology books, fiction, and non-fiction. For awhile, I tried to keep all of my books, but I can no longer do so. My shelves are busting at the seams. Once I read a blog about a guy who kept only 10 books. If he bought one, he had to give one away. I strived to be that guy, but I tended to read too fast and couldn’t give them away fast enough. My list of must-have-books-that-will-always-remain-with me-in-case-I-am-ever-stranded-on-a-desert-island already total up to 50 books or so. I needed an easy and convenient solution to stop my habit of buying books. I’ve been to the local library, but find that it doesn’t have enough of a selection. I’ve even read all of the reptile books from the animals section, but that’s another story. It’s people like me who donate books to the library. It’s a site where you can trade books, music, movies, and games with other users. It’s a one-to-one trade. Simple as that. I signed up about a year ago, but didn’t use it very much, because there were few users who wanted exactly what I had and vica versa. It was difficult to have matches. When I reactivated my account last month, I found that swaptree had improved the trading algorithm, where users can form a trade ring of sorts. Since then, I’ve successfully implemented 4 trades. Seems like I’m trading every week. I don’t even have to go to the post office and haven’t been to the bookstore since. I can print the postage online and swaptree will bill me the amount at the end of the month. The only painful part is entering in the ISBN code of the items I put up to trade. However, the UI manage to alleviate some of the pain by displaying a drop-down of the thumbnail of the book as soon as the system recognizes the UPC, even when I’ve entered it partially. That way, I can confirm that the item I’m entering is correct. It is nice to know that I am not killing more trees with my habit. Hi, my name is Ha Phan and I’m a book-a-holic. J. Crew Learned How User Experience Impacts The Bottom Line. How About Your Company? Apparently, J.Crew customers have been pulling their hair out with botched orders and returns. Some customers were charged astronomical amounts for shipping; others had to deal with lost orders. Attempts to track order status received no feedback. Sounds like a change of e-commerce system. So, what’s the cost of User Experience? In this case, about 2.1 million dollars. The hardest lesson I had to learn early on in my career as UX designer is to be willing to take risks and start all over again. I think this is baggage from my days of working with the waterfall process and designing products that will be “set in stone” (products that ran on Playstation and CD-ROM). You get the sense that once they are done, that’s it. You have no chance of ever changing them again, so it’s too risky to veer off in a new direction. I spent my evening at Barnes & Noble yesterday, reading “The Last Lecture” by Randy Pausch. It is a dying man’s guide on how to live your life. Randy Pausch was a computer science professor, and in his Building Virtual Worlds class, he gave out “The First Penguine Award.” The title of the award came from the notion that although the water is cold and there might be predators in it, someone’s got to to be the first penguine to jump in. The award celebrated “glorious failures” and encouraged “out-of-the-box” thinking. I think every designer has that moment when you know that something is not quite right in the design, but you can’t put quite put your finger on it. Over the years, I’ve learned to trust this instinct as a sign that better ideas congealing in the back of my mind and I must be willing to scrap everything and just start over. Sometimes the risk pays off and I would come up with a completely new design paradigm. Other times, the excersise would provide additional insight and new strategies for tackling the design problem. Fortunately or unfortunately, I’m not an egomaniac designer who ignores budgets, so sometimes I would eat the extra hours just to produce something great. I am always about learning and process first, and money second. Besides, there’s always something about being the first penguine that energizes you. And THAT is priceless. I like designing web sites, because they’re more visible and by that standard, more glamorous. However, I like designing business process applications better, because applications are more function focused. The success of an application is dependent on how well I’ve thought out the workflow and functionality. It is not clouded by marketing. Design strategically for maximum productivity. When you’re designing a web site, you want to maximize clicks and time spent on a page. When you’re designing a business process app, you want the user to complete each task as quickly as possible. The less time spent on a task, the higher the productivity. Prioritize features for roles by frequency of use. Design for maximum scalability and flexibility as businesses can shift direction to respond to market conditions. Differentiate between usability problems and workflow problems. Sometimes what is perceived as a usability issue is really a company’s production and/or red tape problem. Identify and provide solutions for current online and offline workarounds. Don’t just document and design for the current workflow. Look for ways to streamline the company’s current online and offline workflows. Identify other systems (i.e. ERPs or legacy systems) that your application will have to hook into. Flowchart primary and exception use cases to catch functionality loopholes. Templatize functionality/behaviors as much as possible to optimize learnability, user adoption, and minimize development time. 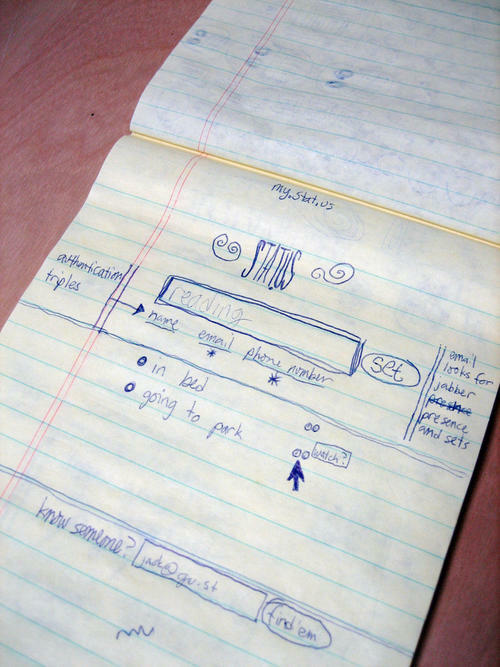 Gather users’ input often throughout the process by conducting quick-and-dirty prototyping. Work closely with the training department to address usability and user adoption issues. When a company has been using a legacy system a long time, it is a cultural shift to move to a new system. YouTube has recently launched a new feature for users to add customized annotations to user generated content videos. This feature opens up a whole new set of possibilities for user experience. Users can now add descriptive text about the video, link to other YouTube videos, or create interactive mini movies with multiple endings. What remains to be seen is if these annotations are integrated within search. This would provide more relevant search results that are pulled from the video content itself. It’s about time, since companies are finding new ways to manipulate the number of views. Wow! I can already see so many implementation models. What’s exciting about this is that this feature puts content at the forefront. It just isn’t another stop light or coffee stand that a company throw out to aggregate or pull in more cheap traffic. What I want to know is why after all this time, corporate training have not caught up with the rest of the world. When it comes to training, companies are still following the same model since 100 B.C. (Before Computer). So I’m exaggerating, but companies are still spending a ton of money on printing manuals, still conducting face-to-face training, and their web based training still remembles the CBTs of yester-years when the pixel is as big as your thumb. By the time the training collaterals are updated, they’re already obsolete, since the software has undergone yet another upgrade. The problem is further aggravated as companies expand abroad and workflows are altered. We’ve always known that a company’s intellectual property is a moving target. It’s never finite. This problem has always been there ever since 100 B.C. However, it has just become more apparent and less managable as the world becomes smaller; and dialog, now a tangible source of knowledge. Corporate training could learn a thing or two by just looking at wikihow, howstuffworks, ehow, and viddler. This model would allow companies to have a knowledge bank that is always current, sharable, editable, and transparent. I mean the comment feature on video streams from Viddler is just so perfect for training, it’s screaming to be ripped off. Seems like a no brainer, right? But I’ve encountered this same problem over and over again everytime I work for a large company with a proprietary software and a complex workflow. I just hope corporate training will catch up to Web 2.0 by the time we’re at Web 3.0. So why am I posting a Consultant Thursday blog late? Just because I haven’t posted in two weeks, I haven’t lost track of time. I just think the reason for my absence is a good blog topic: Burn Out. I’ve been juggling four different projects for the last two months. In order to make it work, I had to be very disciplined, efficient, and organized. My calendar was color blocked from 8:00 a.m. til 11:00 p.m on most days. If something doesn’t go according to plan, or if there’s a shift in schedule, then I’d work until the wee morning hours. There were a couple of days where I worked a straight 14 hours, sleep 3 hours, then get up and do it again. There are also days where I did nothing to give my brain a rest. This is not out of the ordinary, really. It’s just part of being a consultant. Projects never come in a steady rate. It’s either feast or famine. When times are good, you juggle multiple projects. You have to be able to switch gears from one moment to the next; all the requirements and production issues competing for attention in your head. So why don’t I just turn down work? There’s an opportunity to develop a new relationship with a high profile company. When you work for yourself, every relationship, everything you do is a business development opportunity. Hearing all this talk about my crazy life as a consultant, most people would say why I do it. I don’t mind working hard as long as I’m learning. The money is good, but it’s not about the money for me. The sole reason why I am a contractor is because I own my time. I can work really hard when it counts. When there is down time, I can truly give my brain a rest, have the luxury of researching creative solutions, and not dwell in bureaucracy land. Or I can just take two weeks off without filling out a vacation request. I believe that you have to work hard to be lucky. It’s a lot like karma. This comes by courtesy of BoingBoing. 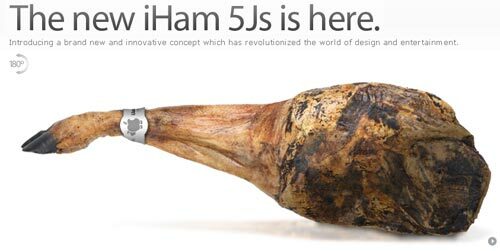 Check out the IHam 5JS , an Apple spoof site by Shackleton, a PR firm in Spain. Absolutely hilarious! It gives me the same satisfaction as when Apple lowered the price of the Iphone after 3 months on the market and made hordes of early adopters “IRate.” Don’t get me wrong. I love Apple products, but the smugness of some Apple-philes drive me nuts. Just goes to prove that even the ridiculous (in this case, a ham) can be cool, if packaged in the sleek Apple grey and presented by an ultra geek in black glasses. Will Users Adopt Spoutless Bottles? So Sam’s Club is now selling milk and orange juice in these new squarish Frankensteinian bottles. The problem is these new containers don’t have any spouts, so spills are almost inevitable. The reason behind this new packaging makeover is green. Green as in cash and green as in eco-friendly. Supposedly, these square containers are easier and quicker to ship. The result is less fuel, less money, less carbon footprint. Unfortunately, this is isn’t form follows function. It’s more like form follows shipment. There’s still the fundamental usability problem of spilled milk and orange juice. The invention of spouts go back hundreds may be even thousands of years. I mean half of the Greek statues I studied in Art History was of a naked person pouring wine from pitchers. And yes, these pitchers all had spouts on them. Last I heard, Sam’s Club is launching a marketing campaign to teach consumers to tilt the bottle and not pour it. Tell this to a six year old kid who wants milk and cookies and their moms who have to clean up after them. I think the money that Sam’s Club saved on shipping these new bottles will go to a marketing and user adoption campaign, at least initially. It remains to be seen if you can teach an old dog new tricks. May be the dog has no choice if the choice is green and the company is Sam’s Club who’s also part of Walmart’s evil empire. That’s the inconvenient truth. In the movie, The Shawshank Redemption, Morgan Freeman described inmates who have been in the prison system too long as being “institutionalized.” In my opinion, this phenomenon also occurs at large corporations, where departments become silos and team members use bureaucracy to hide their shortcomings and inefficiencies. In a word, everyone has become institutionalized. People forget how to work together and function as flexible, dynamic project teams. In these instances, clients don’t really hire UX consultants to solve a design problem. Rather, these companies get into a rut and they just want some fresh blood to shake things up a bit. From my experience, the best products don’t come from one individual or department. Rather, it takes an iterative process with input from various angles of expertise. Even if a forward thinking manager proposes a scrum approach, it becomes like a begrudging behavior change and not a true conversion in attitude. This type of situation can be volatile for a consultant. You have no idea of the political landmines you’re walking into or whose toes you’re stepping on, and those with crushed toes are too willing to throw you under the bus. So what’s a consultant to do in these situations? Do your homework. Conduct careful analysis and research to justify your design decisions, because they will drill you and throw you under the bus. Get ready to be roadkill! Provide the service you were paid to do and sidestep the politics. Be a consumate professional, but speak your mind. There’s a reason why you were hired. I am known to be very direct and I believe companies hire me for my brutal honesty. Have a sense of humor. Sometimes humor is needed is to buffer egos from constructive criticism and makes for easier negotiation. Some of us work for in-house UX groups and others work for agencies. Having been both an “innie” and an “outie,” I can vouch for the fact that I learned a lot more during my experience working for an agency. Here are the pros and cons. The variety of projects makes the work interesting and keeps you on your toes. You never work on one project at one time. You juggle multiple. You learn the nuances of many different kinds of technology and use models. You sharpen your ability to think strategically in your design approach as well as selling your ideas. Since you are presenting your work to new stakeholders on a regular basis, you must justify design decisions with usability goals, business objectives, and/or metric indicators. Everything you put out there has to be polished and your best work. It’s like being a new employee every couple week and you have to prove yourself to a new set of bosses. You learn to work and adapt with many different organizations and teams. Every organization has a different working style and organizational structure. That affects communication and approvals. This requires that you are quick on your feet, since you’ll be constantly drilled by clients. Even when they love what you do, they still drill you. You become a walking encyclopedia of the best on the web. Because of the variety of projects you are exposed to, regular research and analysis are part of the job, even when you are not on the job. Shorter time lines means quicker decisions and launches. After working at an agency, I get impatient at how slow decisions are made and how long it takes in-house groups to develop. Lots of pressure to always deliver the best work. When large companies pay tens and hundreds of thousands of dollars, they expect you to bring your A game and think outside the box every time, so the pressure is intense. A shorter time line and finite budget creates pressure to be extremely efficient. Agencies make their money by being billable, therefore most of your time should be billable. There’s little down time to try out different ideas. Also, when companies hire an agency, they need it done yesterday, so you’re expected to be super creative at breakneck speed. Pay is not as good as working for a large corporation with an in-house group. I no longer work for an agency, because now I can charge more working for myself. However, I think the experience is valuable. I’m so glad that I did it. Best learning experience I ever had.